"PORTRAIT OF A CHAMPION, PORTRAIT OF A FRIEND"
The year 1998 will be forever marked by the passing away of a man who really made America's motorcycle history. 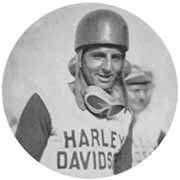 But his request came to the ears of Walter Davidson Jr., who rushed into the racing dept. Being extremely furious, he ordered his employees to immediately build this wheel for Leo Anthony if he needed one, even if necessary parts weren't at hand in the factory building ! 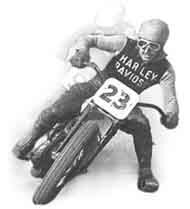 During the 1938 Daytona 200, Ben Campanale finished first, but he had struggled for 182 miles with Leo until he broke his engine at six miserable laps preceding the end of this big race ! His revenge came in 1949, when Leo finished at the 8th place and Campanale at the 32nd. It seems even more impressive when you know that in each one of these 200 mile events, over hundred participants entered the race, a lot of them never making it to the finishing line. Leo was also chosen by Harley-Davidson officials to test a 45" flathead prototype called the WRL, which was mounted in a double loop frame and had a foot shifter and hand clutch, a motorcycle considered by many enthusiasts of today as one of the most beautiful racing bikes ever built. So he returned to Port Huron, Michigan, 70 miles north of Detroit, where he opened a bar he ran for several years. 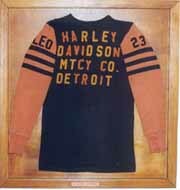 After the war, in 1948, it was also in his hometown that he founded the local motorcycle club (Port Huron M.C.). On the 38 acres this club now owns at three miles from downtown, they have a club house, a half mile track for summer time and an ice track for wintertime ! Of course, ice track racing was also one of the sports Leo used to practice during his career, even into the mid-1960's when he was almost fifty years old ! His last official race was the Auto City Race in Flint, Michigan. When he looked back during that race, he saw the pack of young racers sticking behind his wheel. He ended up having a spill in a curve with his motorcycle and when he went back to the race he tried to catch up the pack during twelve laps without gaining an inch. This was when he definitely decided to stop his career as a professional racer. Among his important victories, he won the 5 Miles National in Montgomery, Alabama, the 10 Mile National in Richmond, Virginia and the Charity Newsies Race of Columbus, Ohio, three races he won within three weeks in 1947. During this busy moment, all he did on his WR engine was to check the spark plugs ! In 1947, he also won the 25 Mile National Championship. The following year, he was the winner of the 3 Miles Nationals in Spencer, Iowa. To these national victories, you can add countless wins in State Championships. The main difference between National and State Championships, besides the greater fame of the first ones, is that you get factory support when you're a winner in a national event and in State Championships, technical and financial is provided by local dealers.
" This was a real diehard racers family !